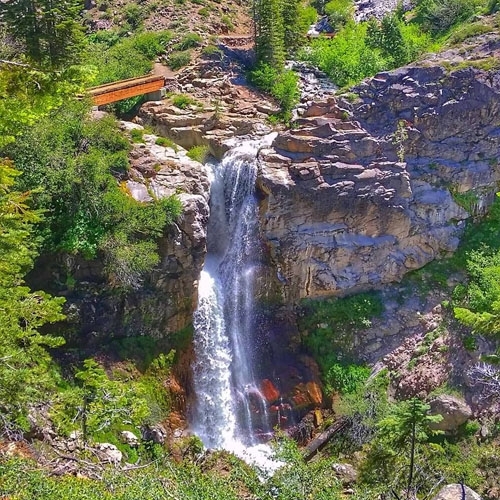 Join Tracy Salcedo, author of Hiking Lassen Volcanic National Park, this summer for a walk-and-talk hike to Mill Creek Falls. The trail descends to the crossing of West Sulphur Creek, crosses an open hillside and follows through forested areas to the falls. Deer are likely to be seen as well as a variety of birds. Mulesears is the common wildflower that covers the open hillside and usually is in full bloom by July. Many other wildflowers, including the blue and white stickseed, can be seen. There are good views of Brokeoff Mountain and Mt. Diller. Salcedo will share her insights into best hikes and best hiking practices in the park. The hike is limited to 20 participants. Cost is $10 and you can sign up online at lassenassociation.org or call 530.595.4464. Kids under 10 are free. * Please note that pets are not permitted on trail.